Form Description: A buyer's guide to be posted by automotive dealers. This buyer?s guide is intended for dealers in states that mandate implied warranties. Includes options for implied warranty only, or a full or limited warranty, and has a place for the terms for the limited warranty option. Vehicle information and an opt-in option for a service contract are also included. This form is in full-page portrait format. 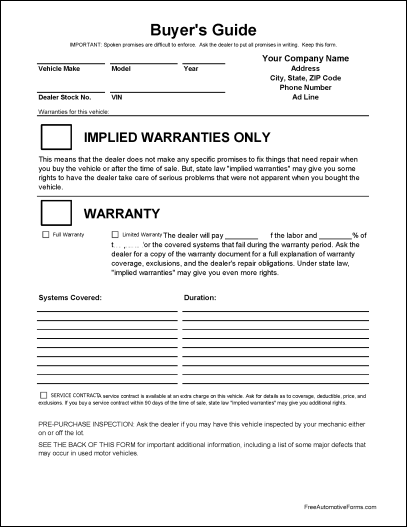 You can download a PDF version of the "Automotive Buyer's Guide for Implied Warranties" form absolutely free. You can also, for a small payment, download a fully editable version of the form that you can customize as you desire. (Don't know which format to choose? Here's how to make your choice.) What would you like to do? FreeAutomotiveForms' free "Automotive Buyer's Guide for Implied Warranties" form is associated with the following keywords: automotive, cars.